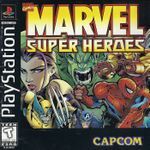 Play as your favourite Marvel character: - Wolverine, Spider-Man, The INcredible Hulk, Captain America, Iron Man, Psylocke, Shuma-Gorath, Blackheart, Juggernaut or Magneto. Power up with and infinity gem - Grant your hero healing power, super attacks and increased strength. A spectacular translation of Capcom's No.1 ranked arcade blockbuster.